Villa Dawn was beautiful - the pictures on the website don't do it justice. When we arrived everything was clean - a pack-n-play was provided for the babies. The directions provided were accurate although we all passed the driveway because the sign was so small & not visible. Kent & Dawn were very attentive - we called about a problem with the internet & a broken picnic table. Kent called back right away & everything was taken care of. We did have a few of us fall & slip by the pool - very slippery!!! Overall, we had an amazing experience. Villa Dawn was a much needed vacation. We hope to come back in the future. We had an awesome time @ Villa Dawn. We enjoyed the house and island!! 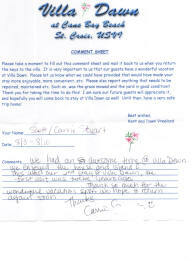 This was our 2nd stay @ Villa Dawn, the first was twelve years ago. Thanks so much for the wonderful vacation spot. We hope to return again soon. We very much enjoyed our stay at Villa Dawn. The house and location were great. I think if there were anything I would change it would be for the lower apartment to be accessible from the interior of the main house. It's not a big deal, but that's the only aspect I might wish was different. I would love to stay at Villa Dawn again some day! Thanks! The villa was even more than we anticipated. It was the most comfortable accommodations we have ever had. We truly appreciate your attentiveness to our needs. Had a wonderful time and hope to visit there again!! Kent & Dawn - Our group had a wonderful time at Villa Dawn. The villa was wonderful and area was wonderful as well. The kitchen was the best equipped kitchen we have found in our travels, the pool was great and the porch was beautiful. There is nothing we can think of that needed repair. Thanks for an excellent experience and we will be back in the future (we booked yesterday). Thank you both so very much for sharing the lovely St. Croix villa with my group. 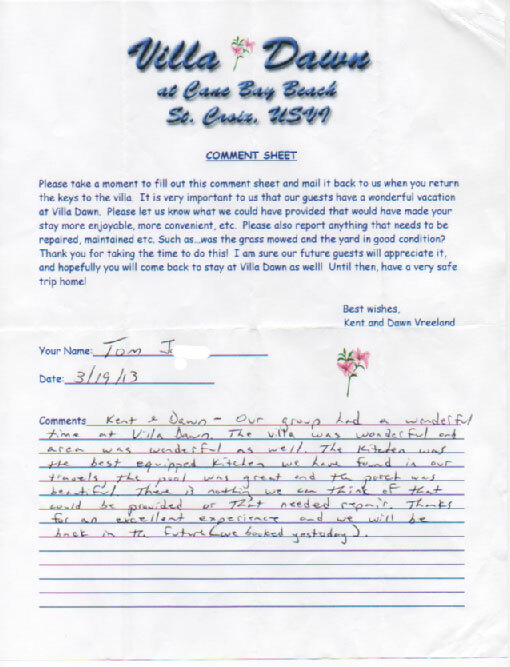 Despite the comment on tripadvisor, our group was very happy with the accommodations. I do hope to stay at your place in the future! Your home was so charming and comfortable. Forgot to write in your book, very busy doing things, and time passed so fast. 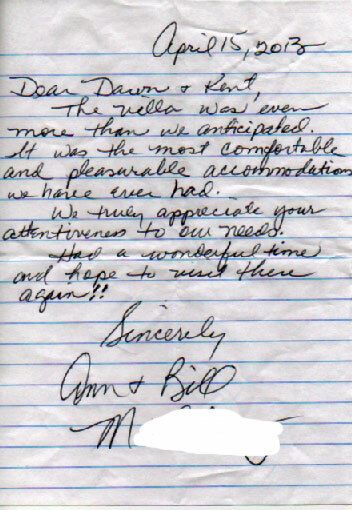 Thank you for the use of your beautiful, comfortable home. Played bingo at Off the Wall, fed beer to the pigs at Norma's, went to Jump Up in Christiansted, etc., etc. Had a favorite (Thrushie) bird who loved tomato juice and visited daily. Had a great time with son at Rowdy Joe's. Thanks so much! We'll be back. We had an incredible week at your lovely home! All four of us (adults) were so pleased with the location, view, proximity to restaurants, snorkeling and activities, pool, thoroughly furnished kitchen and creature comforts! Well done! The only thing which was not working was the pair of binoculars. The power went out briefly on Friday morning, however nothing had to be reset or primed. We looked at the lower level, but didn't use it. We ate and drank at EAT, Off the Wall and Angry Nate's - all good.....also Above the Cliff, but would not recommend it. Most of our meals were at Villa Dawn, however. We particularly enjoyed getting fresh fish and lobsters at the open air market. We did the night kayaking with Brian and the trip to Buck Island with Capt. Miles. 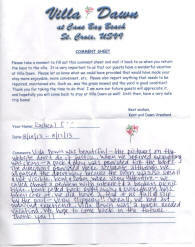 You have done a spectacular job with your rental and the care and understanding were really appreciated. I intend to write a glowing review on TripAdvisor. You provided a wonderful home away from home! Thanks again for the use of your place last week. We are putting your keys in the mail today, and you should get them shortly. Our family just returned from our wonderful stay at Villa Dawn this past week. Thank you for providing such a lovely place for us to enjoy. We thoroughly enjoyed our time in St. Croix. We returned safe and sound from a wonderful vacation. Villa Dawn is Awesome! We definitely found a �gem�. The keys are on their way back to you. Kent & Dawn, The house was fabulous. The beds were so comfy, All things considered, you get an A+. Never had such a well-equipped kitchen in a rental house! 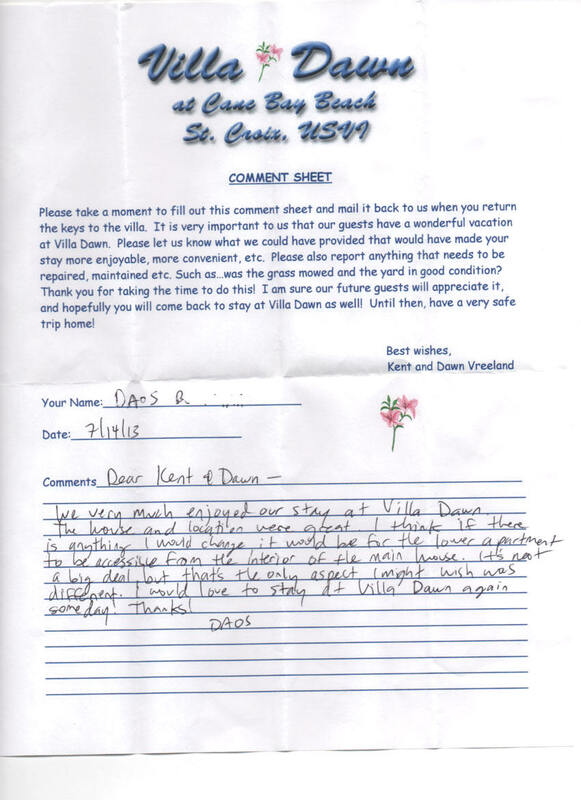 We will recommend Villa Dawn to anyone traveling to St. Croix. Property was in great shape. We noticed several improvements that we appreciated - wish I could have used the TV in the master! Although the weather put a damper on things & contributed to the cable outage & subsequent power issues, we had a good time. PS - Joseph did a good job for us - thanks! Your property manager and maid are doing a really great job. We're leaving our rave reviews in the pirate book and are happy to put up a recommendation on Trip Advisor too. Thank you so much, we're already planning our next trip! 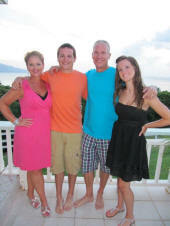 Hi Kent- Attached is a picture of our HAPPY family at your beautiful home. 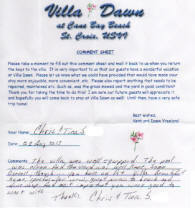 Thank you again for the opportunity to stay at Villa Dawn. As you can tell we are all smiles. I sent the keys a bit late (on Tuesday) as I got sick after I got home- nothing from the water just a bit of a cold. 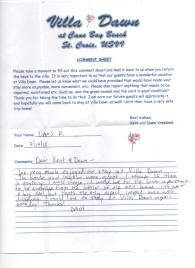 Kent & Dawn, Thank you for a wonderful, comfortable stay. The most "beautiful" views & the villa is located in the right spot on the island. Your cleaning lady will like us as we left it as we found it. What a marvelous place! We had such a wonderful time - enjoyed every minute. We're already looking forward to a return visit. Daughter P's wedding was beautiful at Carambola. WE ENJOYED A FUN VACATION AT VILLA DAWN. THANKS FOR ALL YOUR EFFORTS. WE HAD A GREAT TIME AND ENJOYED OURSELVES. THANKS FOR THE MEMORIES !!! PS KEYS ARE IN THE MAIL ! We had a great time in St. Croix. Thank you for the use of your villa. Enclosed is one set of keys. My daughter has the other set and will mail them back to you. 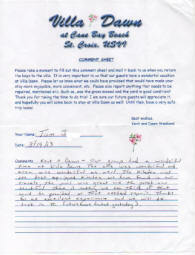 Overall great accommodations and great location for vacation. Left very positive comments at villa. We forgot to tip Jennifer, the cleaning help. Please forward enclosed check. Thanks and hope to be back someday.